This time of year is just so lovely. I am a sucker for all that the Fall brings: the cold weather, the pumpkin goodies, the colorful leaves, and gigantic holiday meals. But beyond that, this is a time of celebration, of thankfulness, and of family. I think my specific love for the Thanksgiving holiday originated during the years I lived far away from my family. No matter how crazy life got or how distant I may have felt, Thanksgiving was the light at the end of the tunnel: it held the promise of seeing my family. It didn’t matter where my parents lived or what city we celebrated Thanksgiving in, somehow it always felt like home. Candyce would spend hours drawing woodland creatures on Thanksgiving placecards, Danielle and my dad would argue over watching the Macy’s parade vs. watching football, while my mom and I would race about the kitchen to get dinner on the table. These days, Thanksgiving looks a little bit different. I now live in the same city as my parents (and both of my sisters), and I see them all the time. Thanksgiving is no longer an escape from my crazy life; rather, it is a celebration of all that my life has become! My life is really wonderful, and my family seems to be getting larger by the day. In the last couple of years I have gained a (wonderful) husband, an (adorable) niece, two brothers (in-law), and two sets of in-laws. I have a lot to be thankful for. As for this recipe, it is a simple and elegant twist on the classic Thanksgiving Cranberry Sauce. 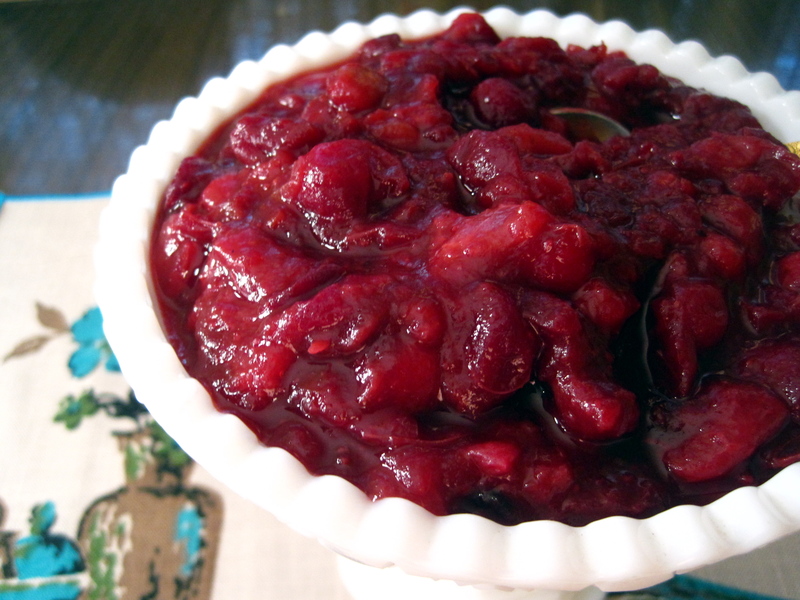 Over the years, I’ve made many variations of cranberry sauce (compotes, chutneys, etc.) Cranberry sauce is delicious in many forms, and thus I try to switch it up every year. I will admit, this is one of the best cranberry sauces I’ve made to date. It is the perfect blend of winter fruits and flavors, it is low in sugar, and is made from whole fresh fruit. And, this cranberry sauce makes the perfect turkey cranberry sandwich. Let’s be honest: cranberry sauce isn’t so much a Thanksgiving dinner necessity as it is a leftover turkey sandwich necessity. For me, nothing beats the a turkey cranberry sandwich the day after Thanksgiving. Place the cranberries, water, and sugar in a small pot over medium heat. As the water and cranberry mixture heats up, stir occasionally (you’ll hear the cranberries start to pop). As the cranberries break down, the mixture will thicken. Once the mixture starts to thicken (5+ minutes), add in pears, cinnamon, orange zest, nutmeg and cloves. Reduce the heat and allow the mixture to simmer gently until it reaches the desired consistency (another 5-10 minutes). Allow to cool before serving or freezing. Be sure to remove whole cloves or cinnamon sticks before consumption! This compote pairs well with a variety of meats, its fantastic on a turkey sandwich, and it is wonderful on its own (by the spoonful). With a little extra sugar added into the recipe, this also worked really nicely as a filling for mini hand pies (like these mini turnovers I made a while back). ← Thanksgiving roundup & Meri’s pumpkin pie.